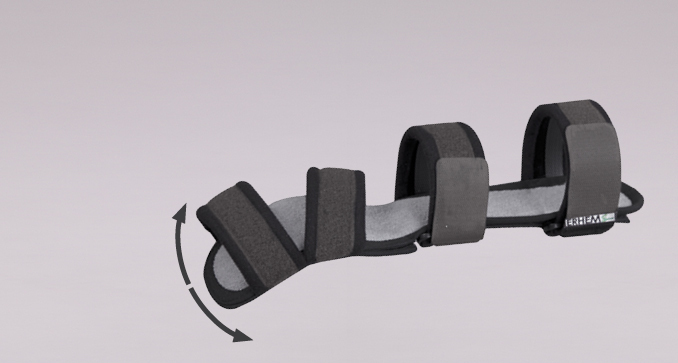 The orthosis immobilizes the foot in the intermediate position. 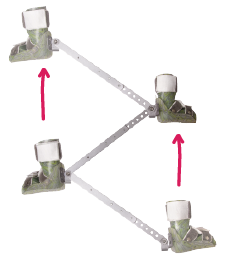 The rail adjusts the foot position in relation to the lower leg. It is possible to sleep with one straight leg and the other one bent, reducing overstrain to the knees. The child can turn easily and crawl on all fours. 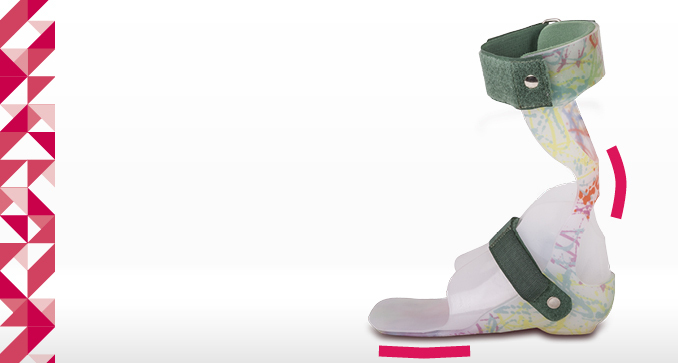 Friction on the heel is reduced and the possibility of pulling the feet out of the orthosis is minimized. The comfort of use and children’s acceptance are increased. 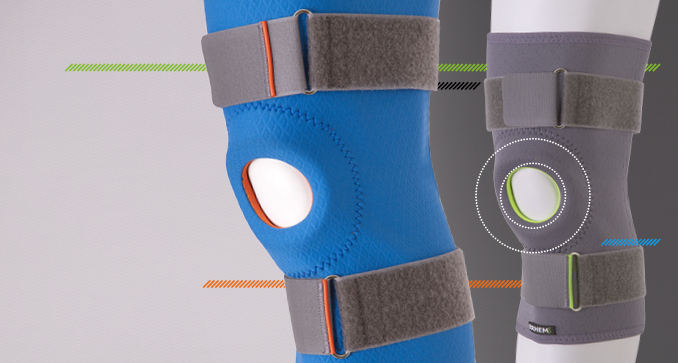 Prevention of minor trauma to the knee joint. Nursing the joint during immunological and strain-related degenerative disorder. Prevention of minor trauma to the knee joint. Nursing the joint during immunological and strain-related degenerative disorder. 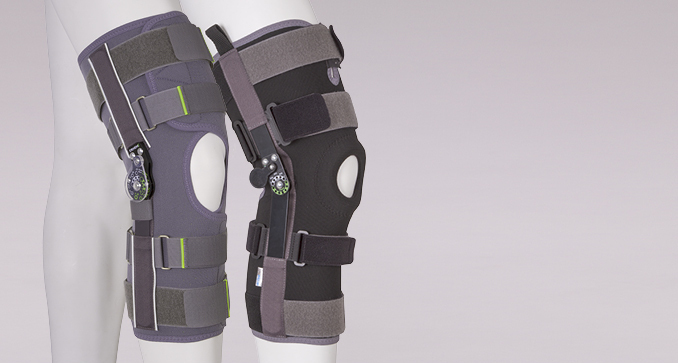 Additional knee cap stabilization prevents traumatic and habitual displacements. 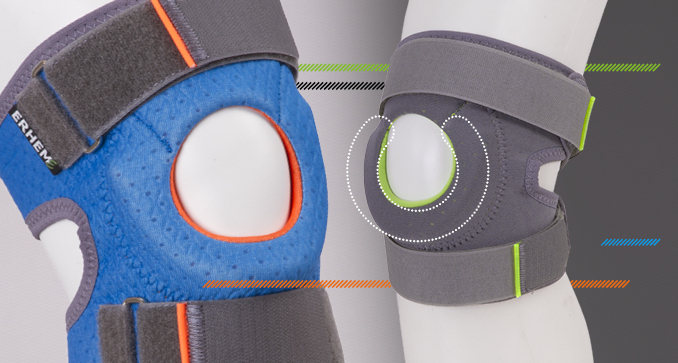 Stabilization of the patellar-thigh joint in the prevention of contusions during sports activities and a complement to post-traumatic joint rehabilitation. Healing completion and convalescence after traumatic injuries of the knee joint. Protection in physical exercise during active rehabilitation. 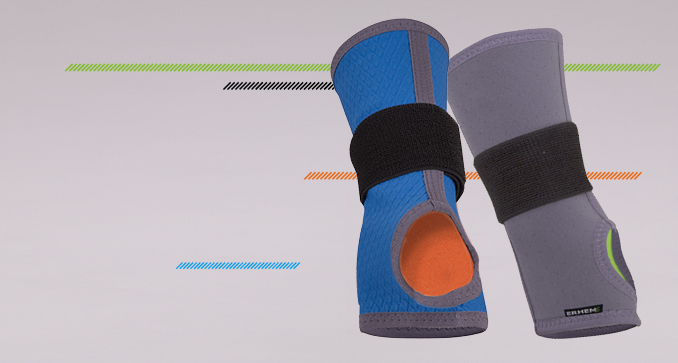 Additional stability through four metal lateral fins enhances joint stabilization. Healing completion and convalescence after traumatic injuries of the knee joint. Protection in physical exercise during active rehabilitation. 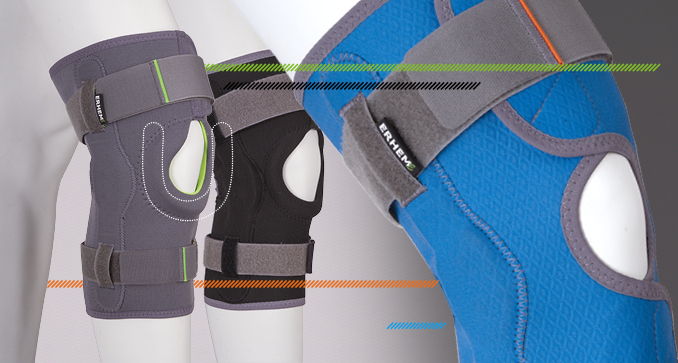 Additional stability through four metal lateral fins and slant belts enhances the joint stability. 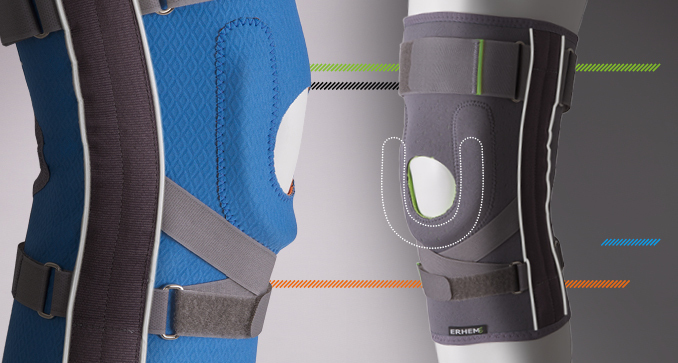 The sewn-in biaxial lateral splints provide stability and safety during sports activity and the return to full physical performance. Indispensable in treatment, completion of treatment and prevention of traumatic, bacterial and degenerative dysfunctions. 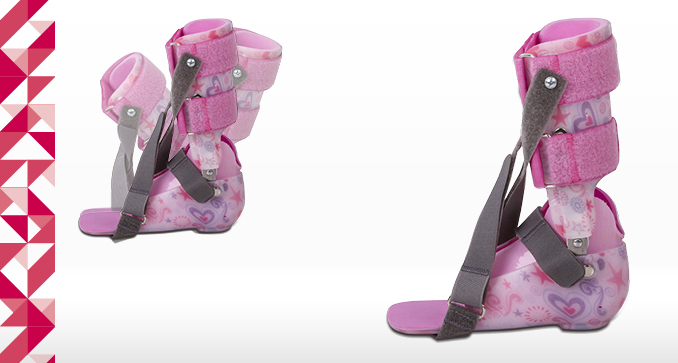 For children with CP and myelomeningocele in the absence of control of the pelvis and lower extremities. 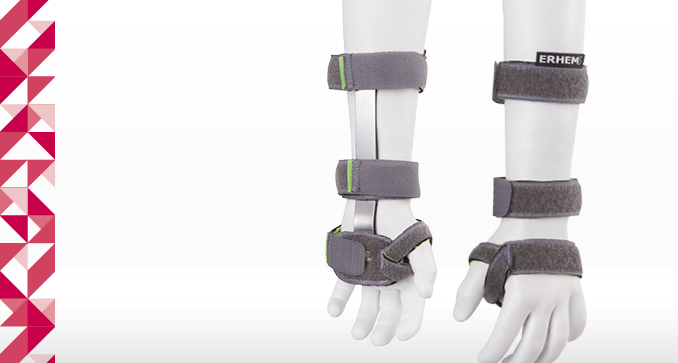 It stabilizes the lower limbs and trunk during upright standing and walking reeducation. 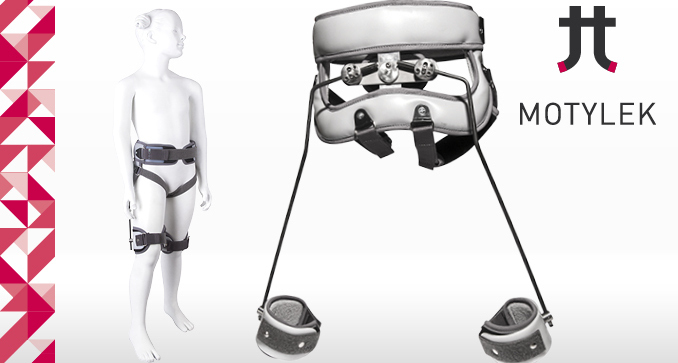 The apparatus is designed for patients with increased or spastic hip adductor work that causes pocket knife walking in the course of cerebral palsy, and secondarily it may lead to subluxation or dislocation of the joint. The apparatus in a static operation immobilizes the hip joint in any angle of abduction, flexion and extension of the limb. 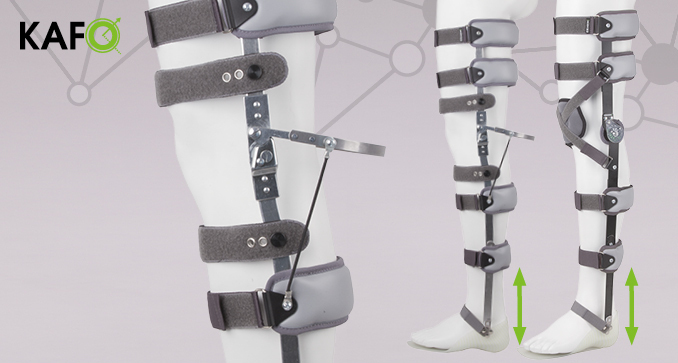 In a dynamic operation it stabilizes the pelvis, prevents internal rotation and adduction / crossing of the limbs during walking. 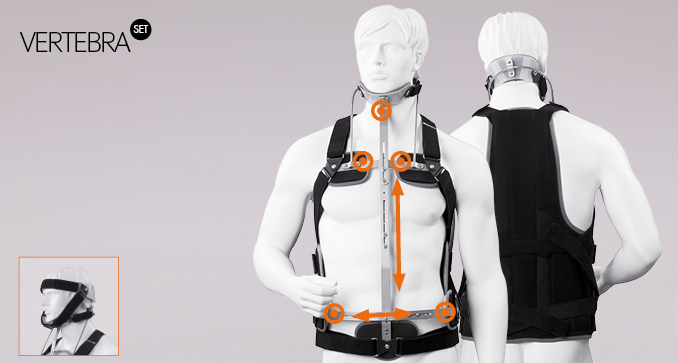 It also supports the reciprocating movement of the limbs, including the movement of the pelvis in the frontal plane. 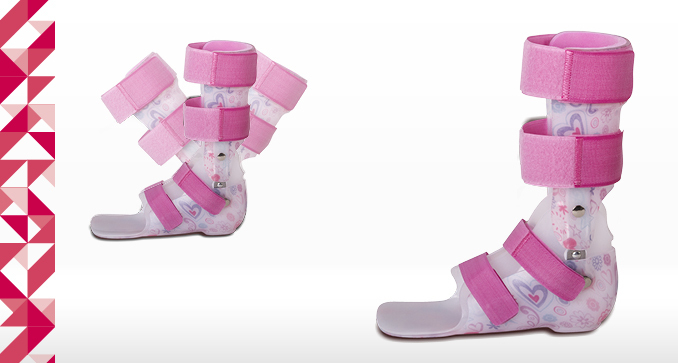 The orthosis is designed for children with congenital or acquired dislocation and dysplasia of the hip joint. 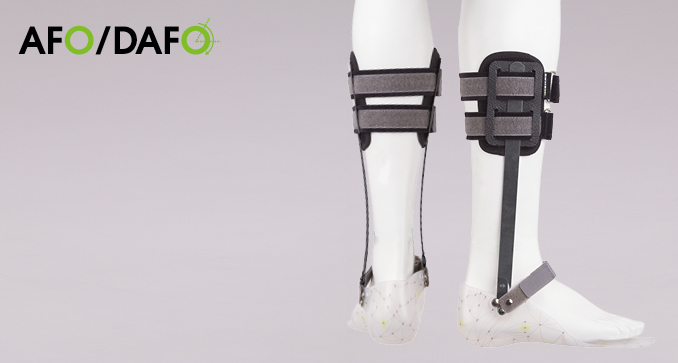 The orthosis through its easy and simple forming ensures alignment of the lower limbs at any angle of abduction and flexion in the hip joints. The apparatus corrects excessive internal or external rotation in the hip joint and the position of the foot towards the lower thigh. 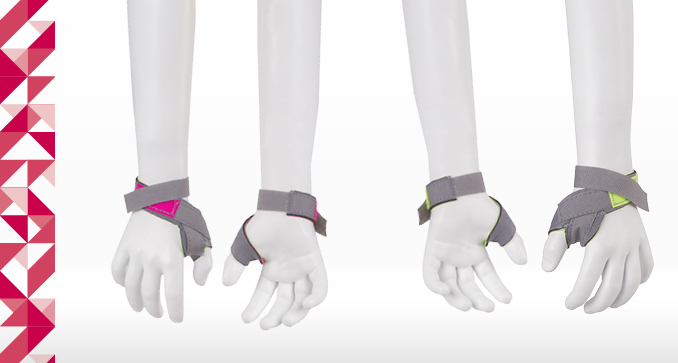 The material used is skin-friendly, does not cause irritation and does not limit the movements. 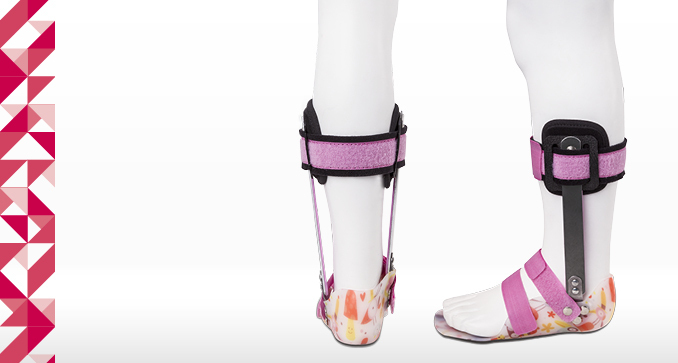 The tutor immobilizes the joint in an intermediate position and corrects the adduction and abduction of the forefoot and the heel bone. 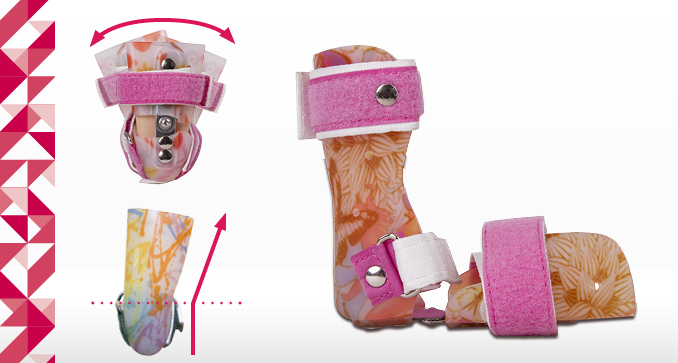 Allows easy adjustment of foot turning to the outside and dorsal flexion. By correcting a valgus deformity of the calcaneus, supporting the navicular and longitudinal arch of the feet, it restores proper foot anatomy and functional movements in the joint. The correction of the position of the calcaneus and other tarsal bones. Reducing the load within the second and third metatarsal bones. The correction of the big toe. The restoration of normal anatomical conditions of the foot. 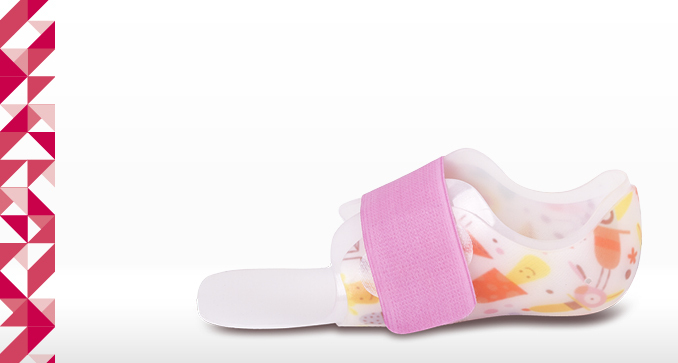 The series of orthoses is made individually and designed for children and young people who need to improve static or functional conditions of their foot and ankle joint in the course of disorders and dysfunctions of the central or peripheral nervous system. 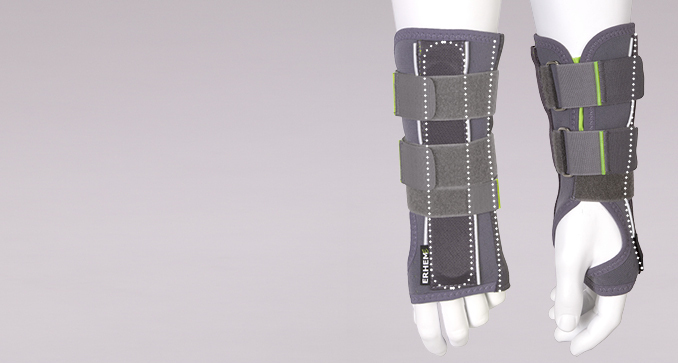 This series of orthoses is manufactured individually. 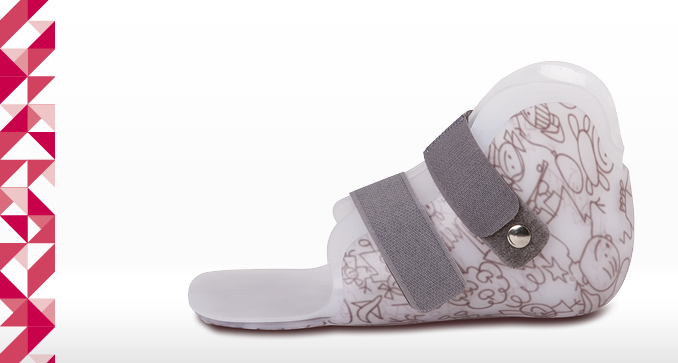 It is designed for children and young people who need to improve the static or functional conditions of the ankle and foot in diseases and dysfunction of the central or peripheral nervous system. 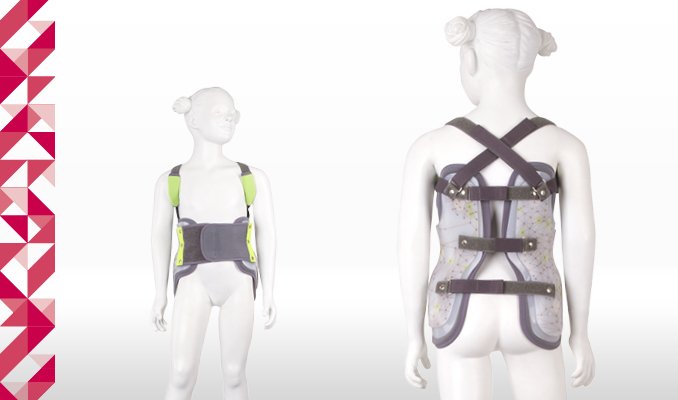 The apparatus designed for Patients with walking disorders in the course of disease and dysfunctions of the central and peripheral nervous system. 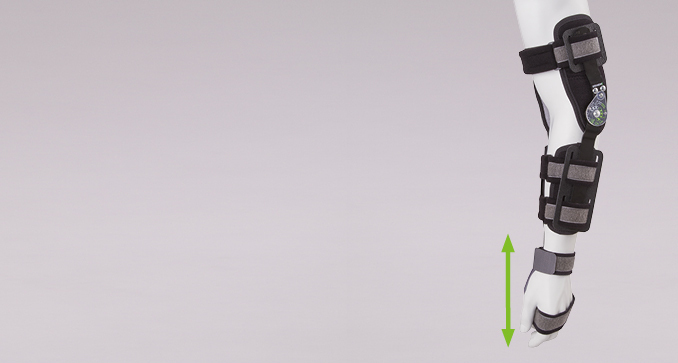 A flexible part of the foot is equipped with a contoured longitudinal arch, reduces supination and pronation of the foot and dynamically restores it to the intermediate position during movement. An orthesis with a static, resting action. Intended for day or night use. 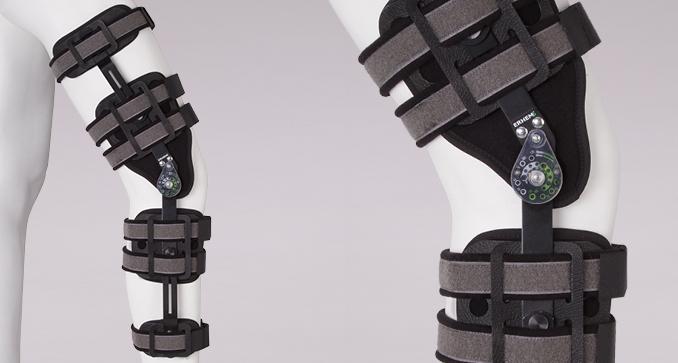 It stabilizes the entire lower limb in extension and affects on the knee joint correctively. The device is to be used at night. 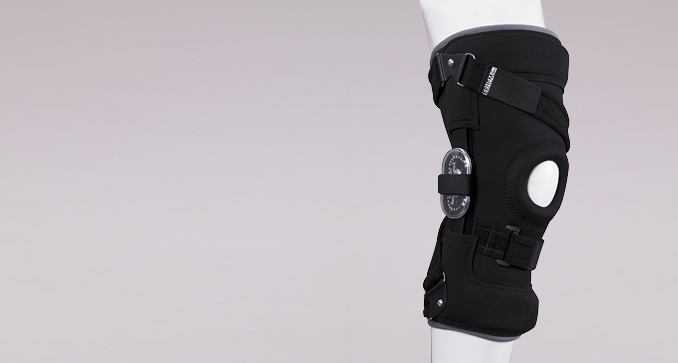 It stabilises and immobilises the knee joint and ankle in extension to maintaining the therapeutic effects as a result of exercise and orthopaedic surgical intervention. 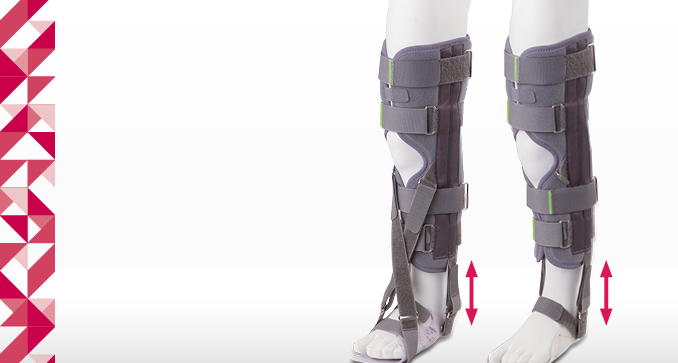 Low weight of the device and a soft, lined shoe with the thigh and tibia section ensure comfort of use. 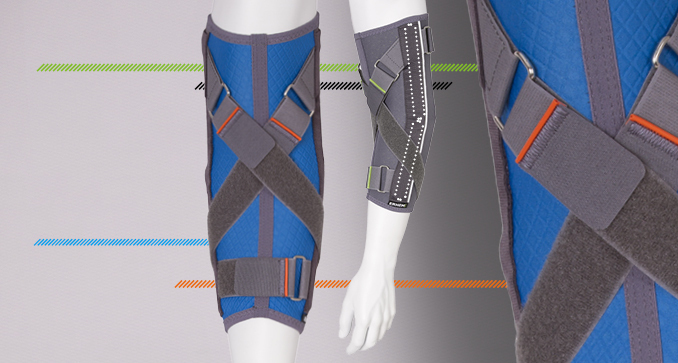 The orthosis in a static operation. 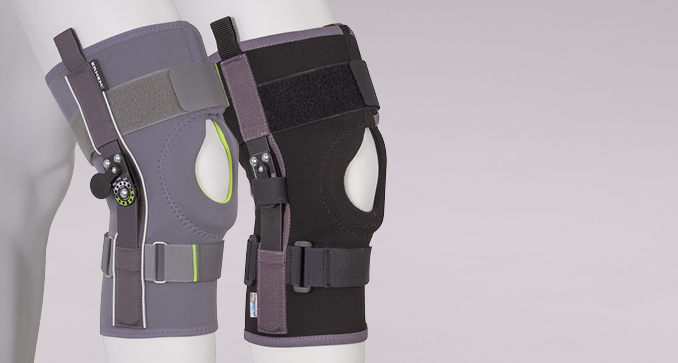 It stabilizes and immobilizes the knee joint in flexion relatively every 20°. 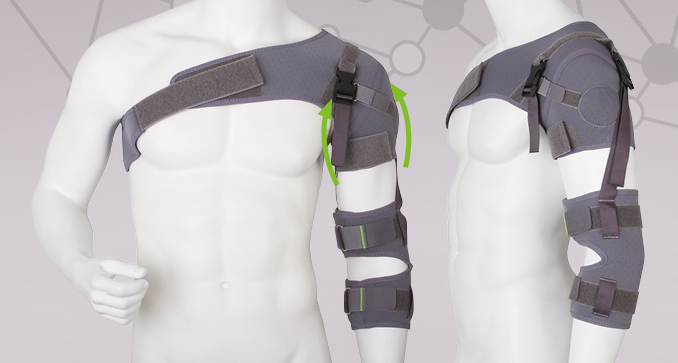 Side immobilization has the possibility of individual forming. 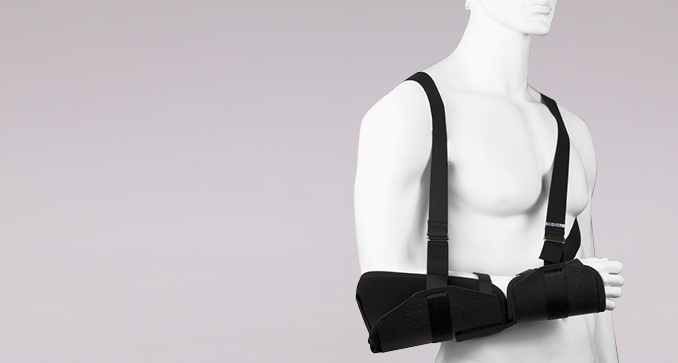 The apparatus is quipped with an extension mechanism of the joint. 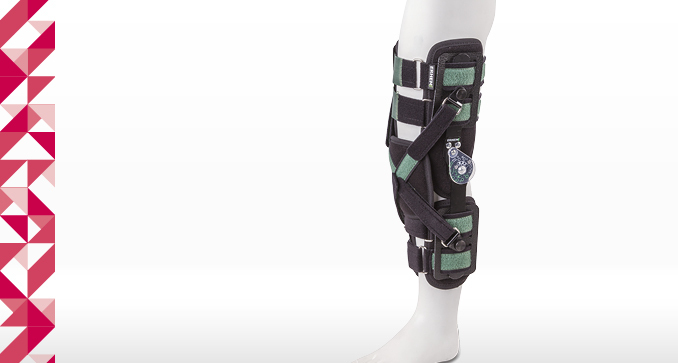 It is used in case of spasticity and muscle contractures bending the knee and ankle joints. 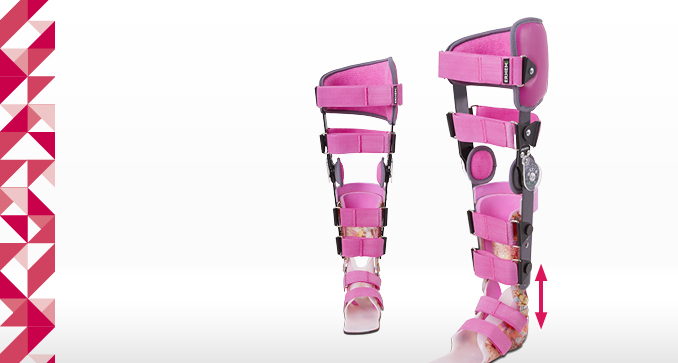 It has the possibility of adjusting the length of the side rails of the ankle joint. 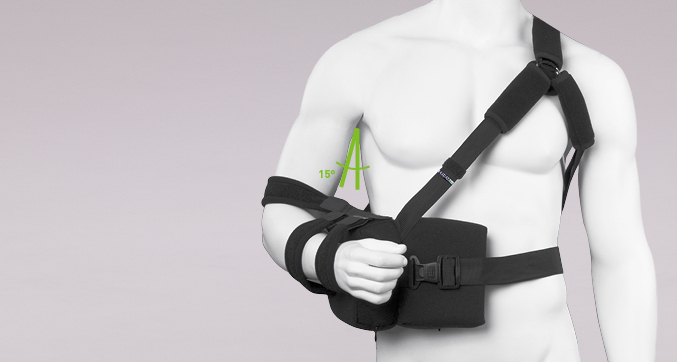 The apparatus is quipped with an extension mechanisms of the joint. 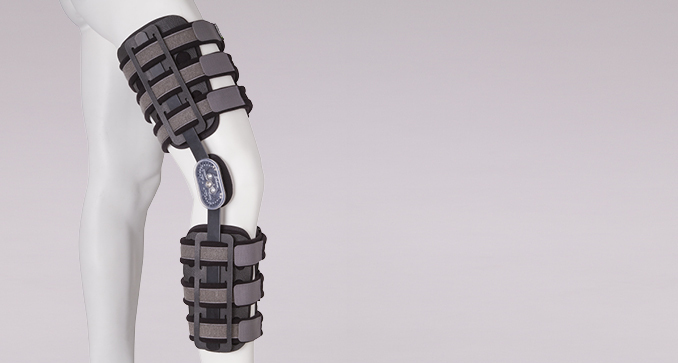 It is used in case of spasticity and muscle contractures bending the knee and ankle joints. 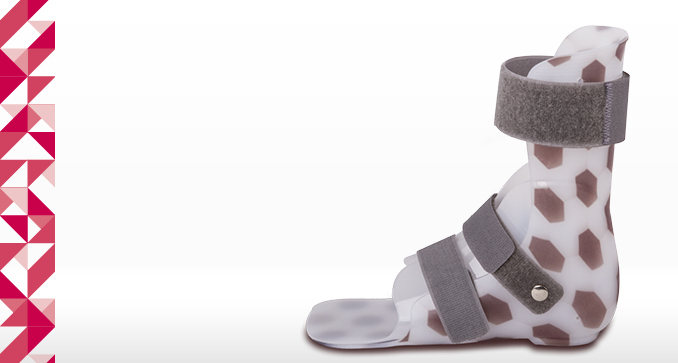 It also comes in a version covering the ankle joint and the foot. 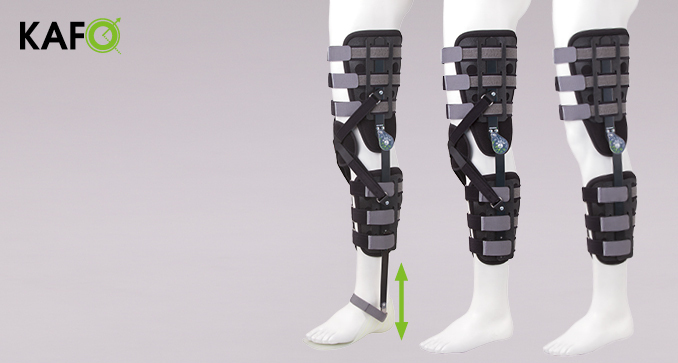 The apparatus with a rigid frame construction covering the whole lower limb. 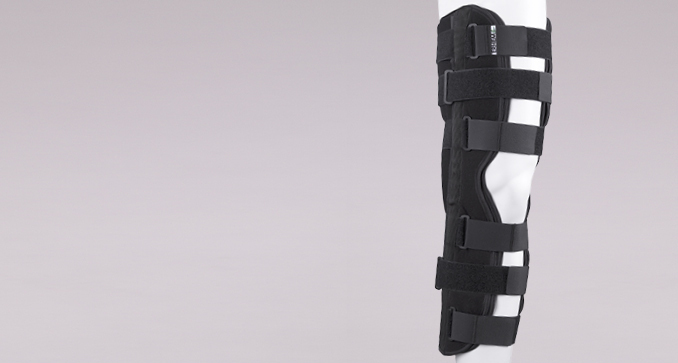 It stabilizes the knee joint and ankle joint in the case of dysfunctions of various origins. 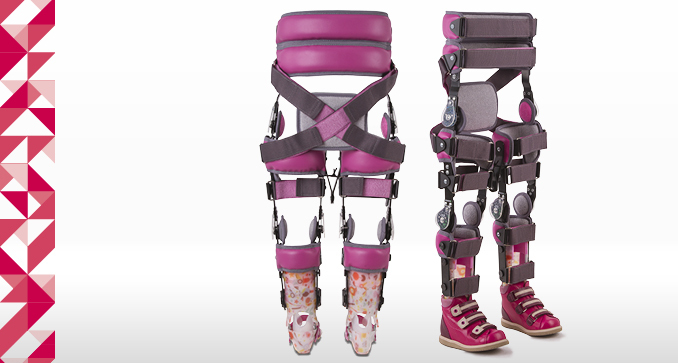 It has the possibility of adjusting the length of the side rails of the ankle joint, ensuring the individualization of the apparatus to the child’s height. 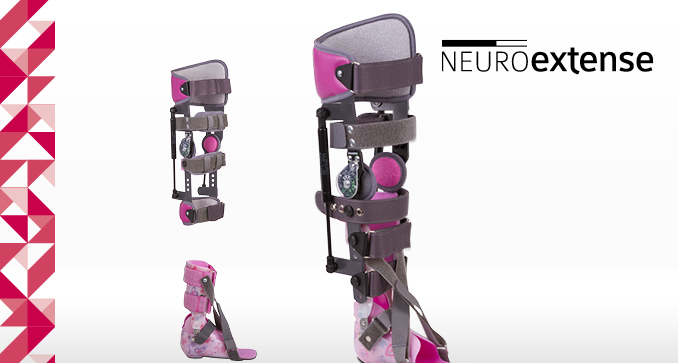 KAFO NEURO intended for patients with dysfunctions in the lower limb motivated primarily neurologically. 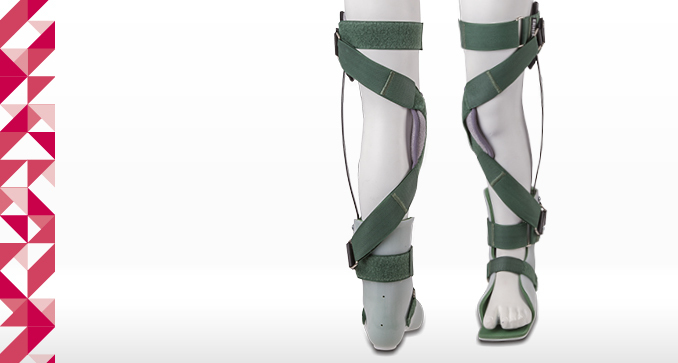 It stabilizes the entire lower limb during walking and allows the immobilization in extension. 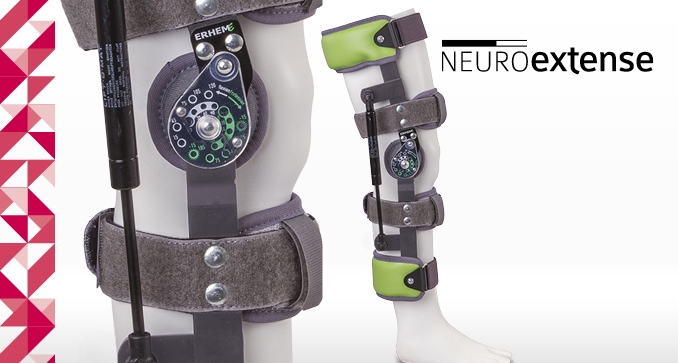 KAFO NEURO intended for patients with dysfunctions in the lower limb motivated primarily neurologically. 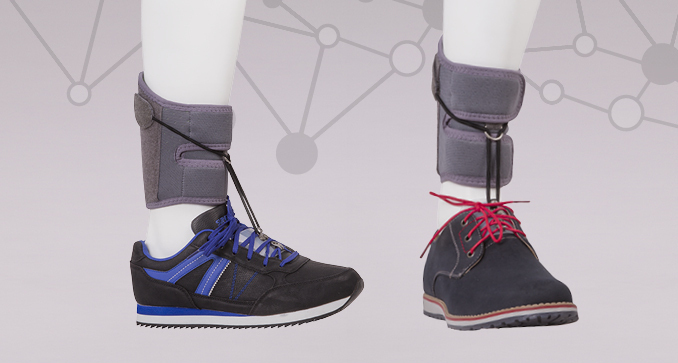 It stabilizes the entire lower limb during walking.It allows immobilization in extension or the limitation of the motion range. 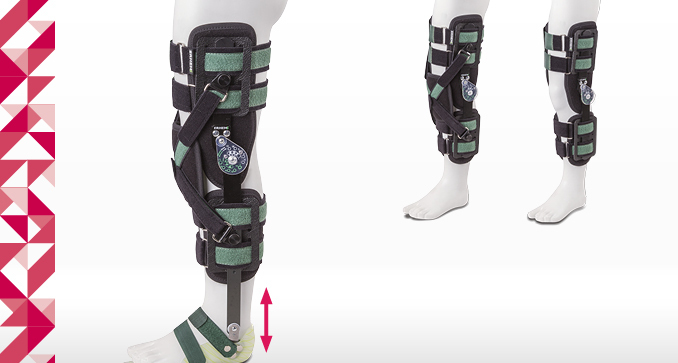 The apparatus stabilizes and immobilizes the knee joint. It is equipped with side rails and a breech of the joint with a possibility of adjusting the angle of flexion and extension every 15°. 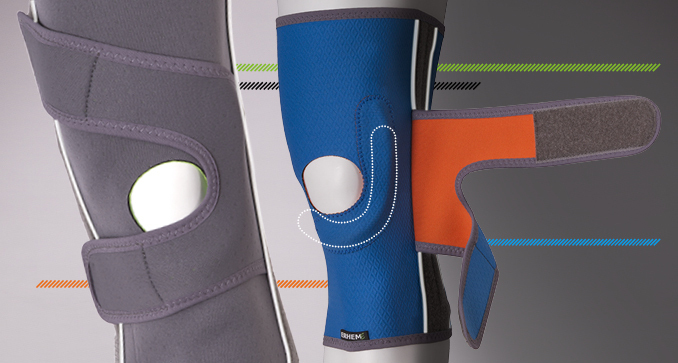 The resurfacing head of the knee joint additionally stabilizes in extension and improves the upright position. 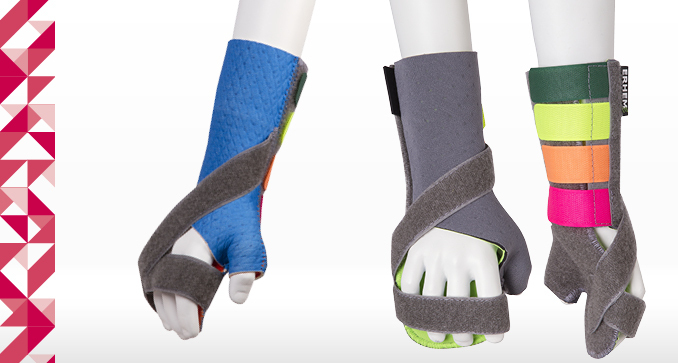 A series of orthoses intended for children with a functionally wrong positioning of the wrist and the thumb joint in the course of neurological disorders. 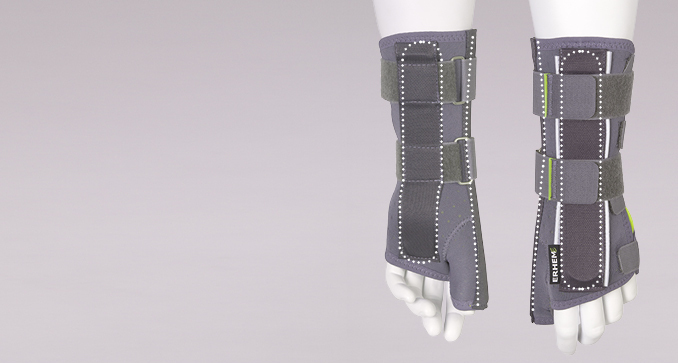 The orthosis covers the thenar and the thumb, abducts it and prevents its flexion positioning. The splint covers the wrist, palm and fingers. 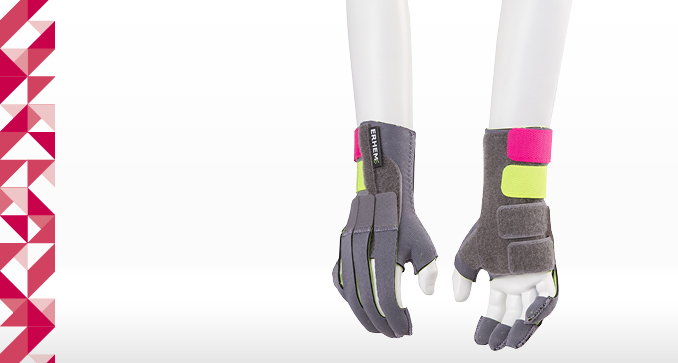 It allows individual forming of the palm ensuring the correction of the palm and fingers. The Classic version for patients with orthopedic injuries mostly. 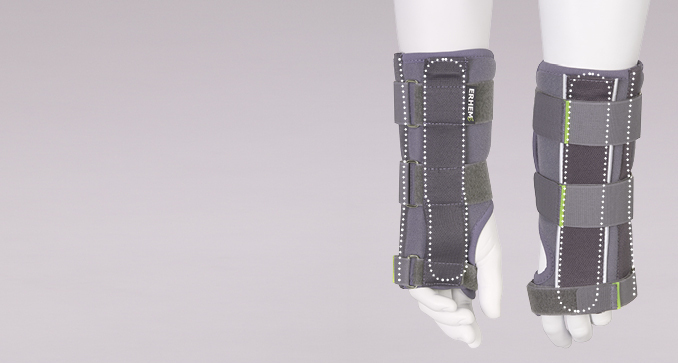 It stabilizes and immobilizes the elbow in extension. It has side supports, which can be individually formed. 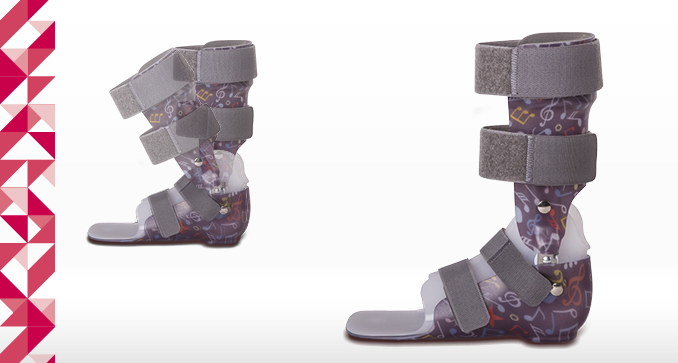 It is an alternative to conventional plaster cast used in case of injuries and after orthopedic surgeries. 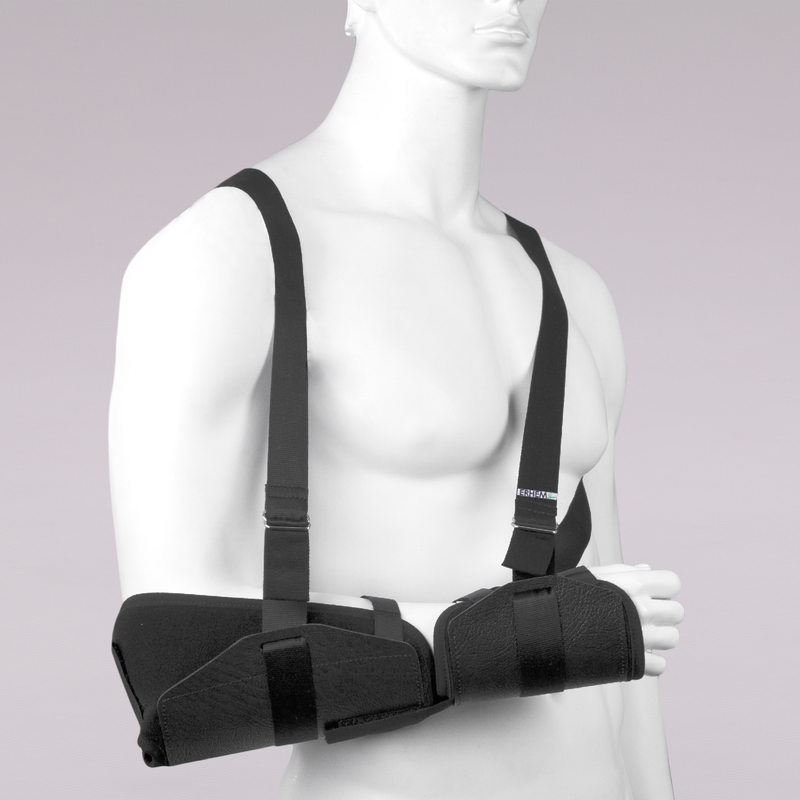 It stabilizes the shoulder girdle in the conservative treatment of the clavicle fractures. It complements the program of corrective exercises in the habit-forming process of correct posture. Extension brace acting primarily in the sagittal plane. 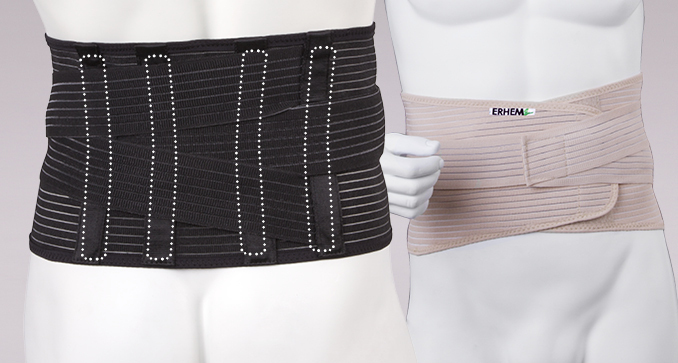 It stabilizes and relieves thoracic-lumbar-sacral spine. It corrects the position of the shoulder girdle and the deepened thoracic kyphosis. 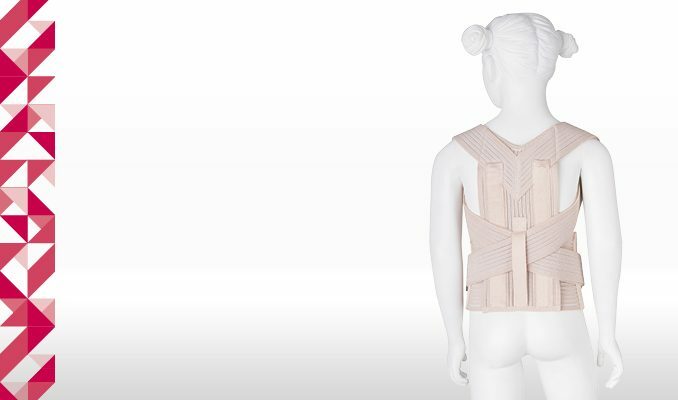 A corset with extension action, immobilizing in three planes, with optional additional stabilization of the cervical spine. 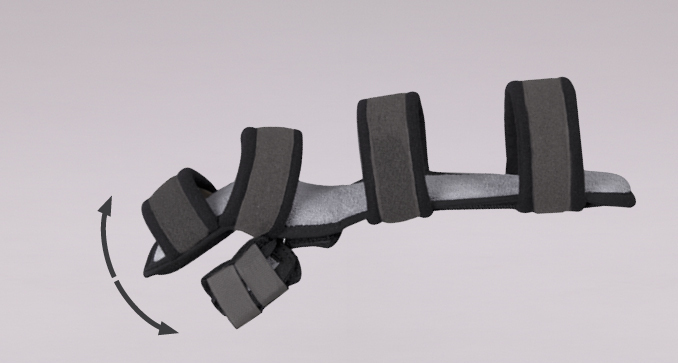 A semi-rigid orthosis with extension action mainly in the frontal plane. 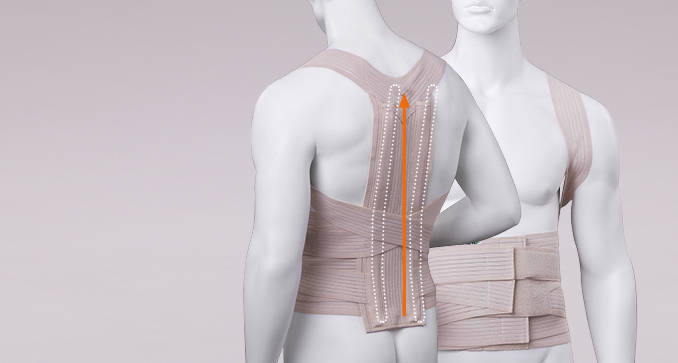 It enables the stabilization and correction of the trunk relative to the pelvis. 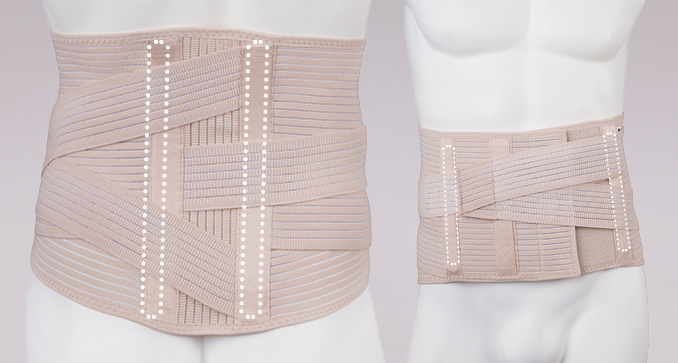 It prevents lateral spine curvatures. 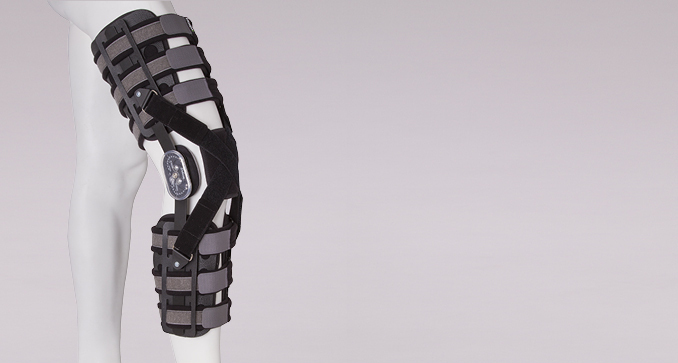 A rigid orthosis with extension action mainly in the frontal plane. 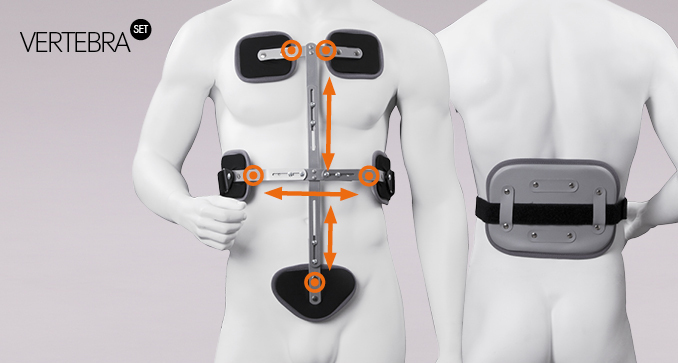 It enables the stabilization and correction of the trunk relative to the pelvis. 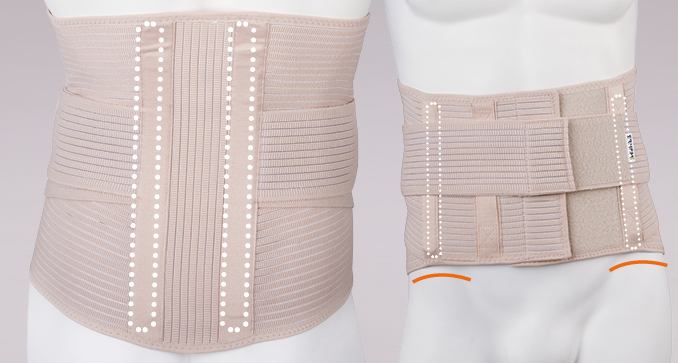 It prevents lateral spine curvatures. 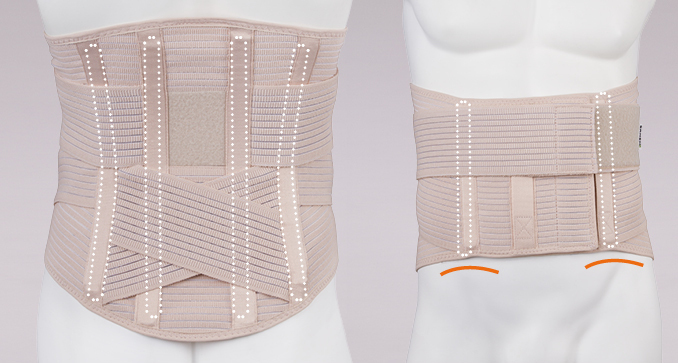 The aim of a corset is to obtain correction and halt the curve progression in children s growth jumps. 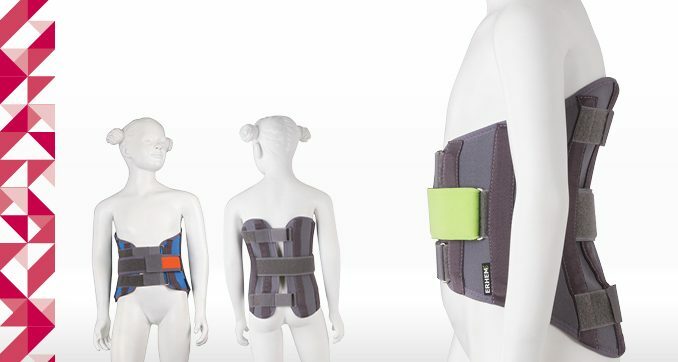 Other purposes of the corset are: providing vertebrae, muscles and ligaments correct conditions for growth and development through freedom of movement when performing exercises aiming at their rehabilitation and recovery. 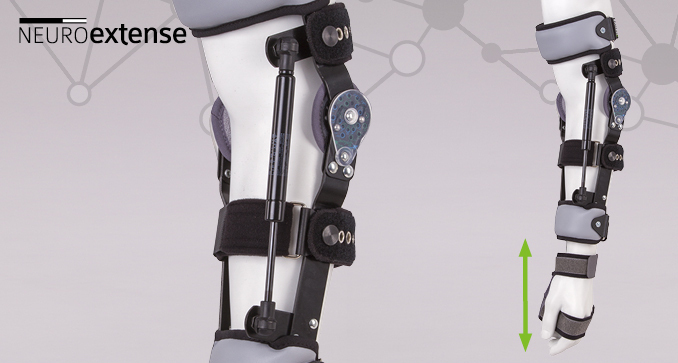 A device with two side bars which has an effect on foot, ankle and shank, knee joint and thigh. 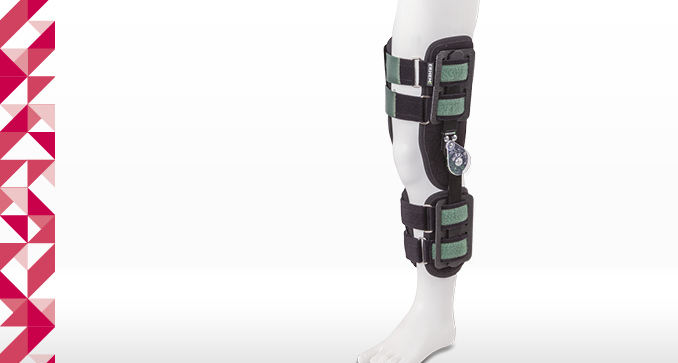 Provided with pneumatic knee extensor mechanism. 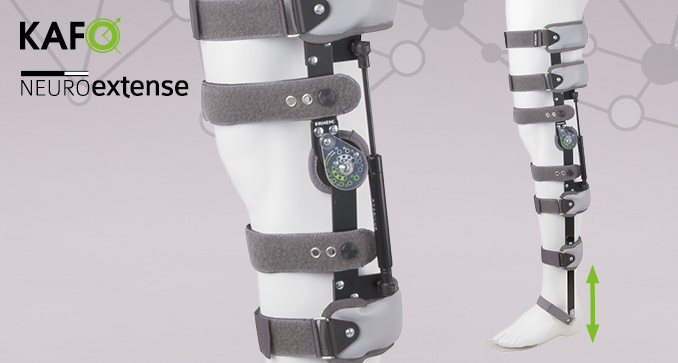 For patients with various neurological and orthopaedic dysfunctions of lower limb. Used in paresis and paralysis of knee and foot extensor muscles. 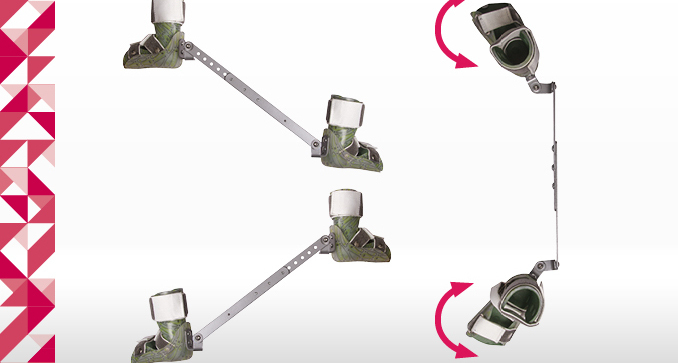 The apparatus with double-rail construction stabilizes the foot, as well as the knee and ankle joints. 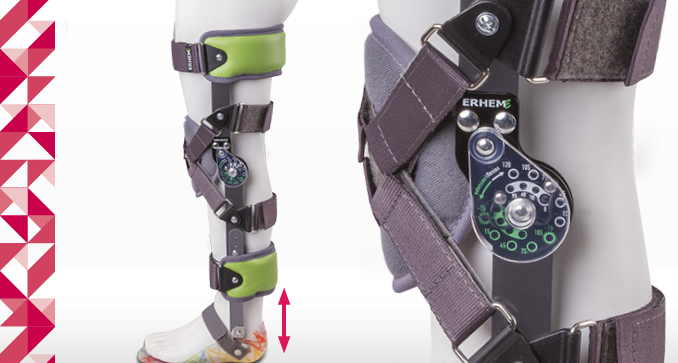 Three points in the thigh and shin parts allow for individual fitting of the apparatus and the adjustment of the degree of stabilization. 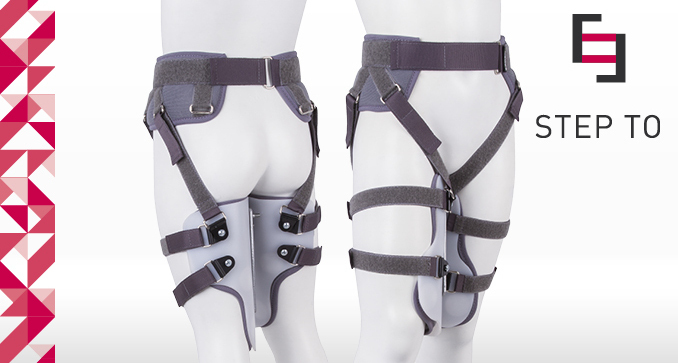 The apparatus with a rigid framework with two fixed points of the thigh and lower thigh support. 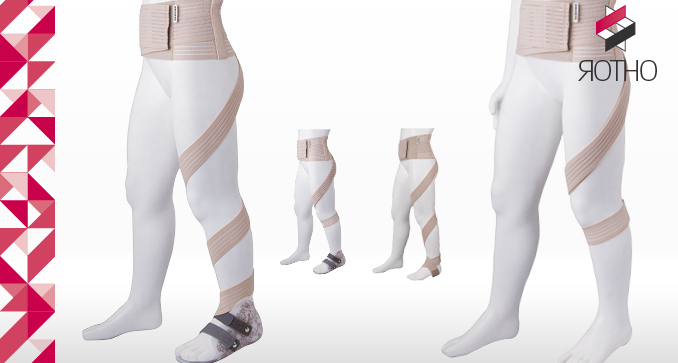 It stabilizes the entire lower limb in the course of dysfunction of various origins. 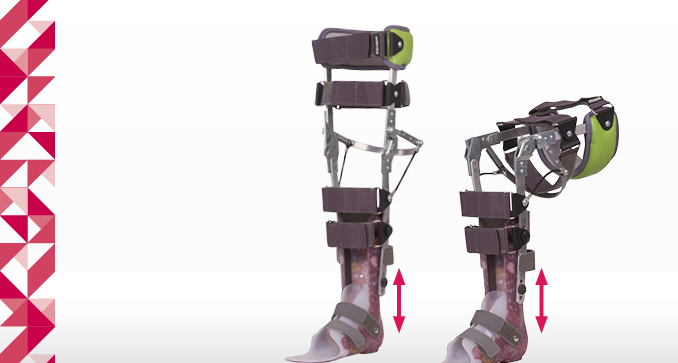 It has a possibility of the height adjustment of side rails within the ankle joint with the possibility of removing the alloy part. 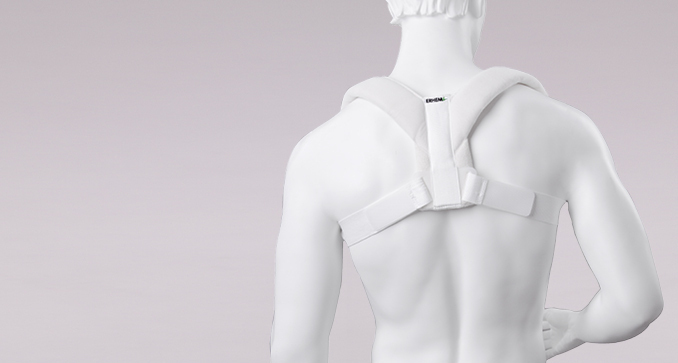 The system of crossing straps and lateral bracing enhances the joint stabilization in cases of instabilities, as well as reinforces against and prevents contusions during the return to daily activities. 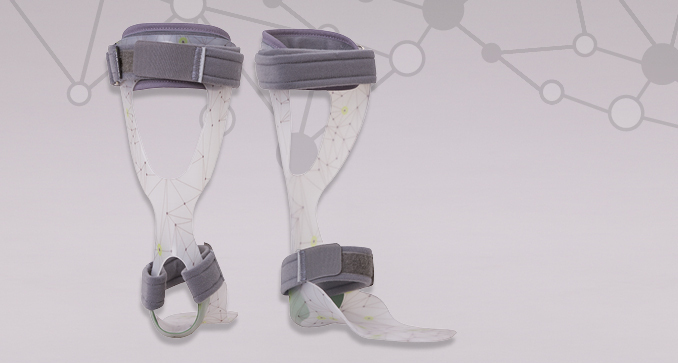 Device with two anatomically profiled and shaped orthosis providing side and medial ankle stabilisation. 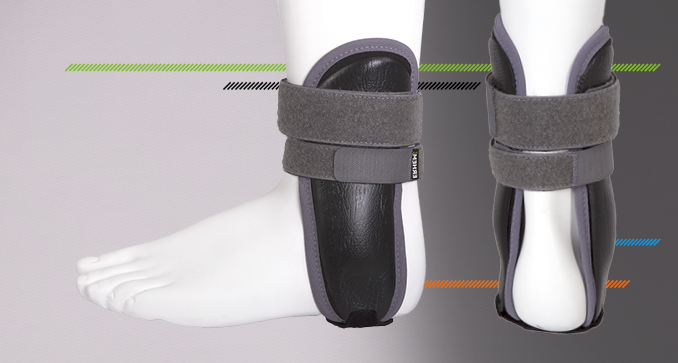 It ensures proper stabilisation without limiting plantarflexion and dorsiflexion of the foot. 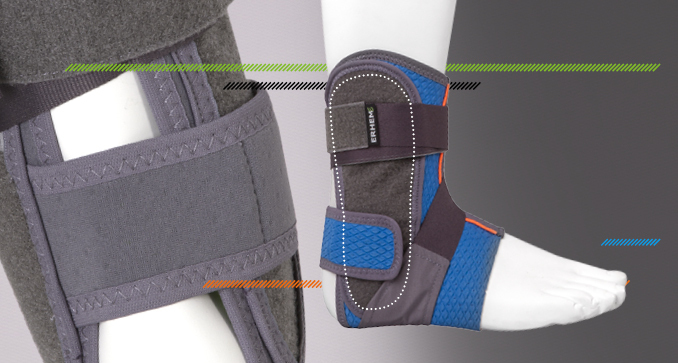 Diagonal strip provides protection against excessive foot supination. Two contoured lateral scales stabilize laterally-medially the ankle joint without restricting the movement plantarflexion and dorsalflexion movements of the foot. 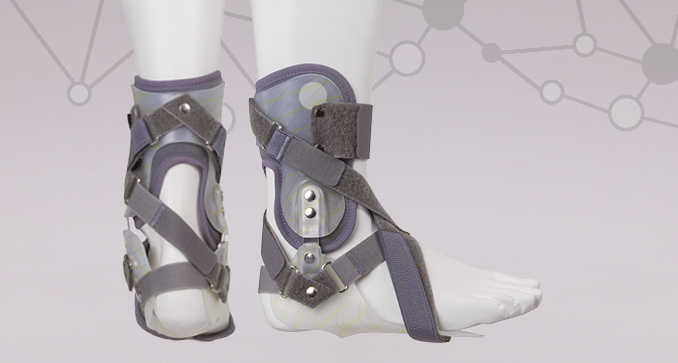 The apparatus stabilizes the foot and ankle in an intermediate position. The anterioposterior substrings additionally stabilize in the above mentioned position or support the plantarflexion and dorsalflexion movements of the foot. 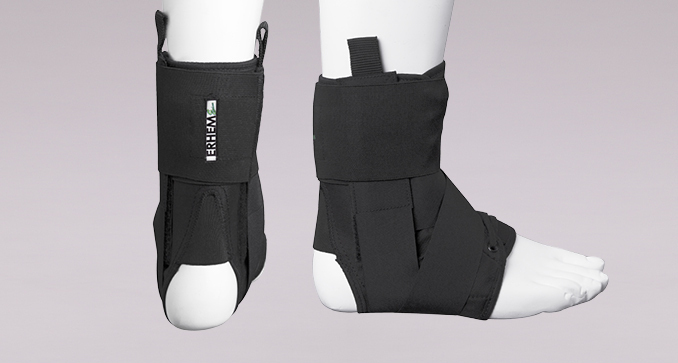 A device with two side bars which has an effect on foot, ankle and shank. 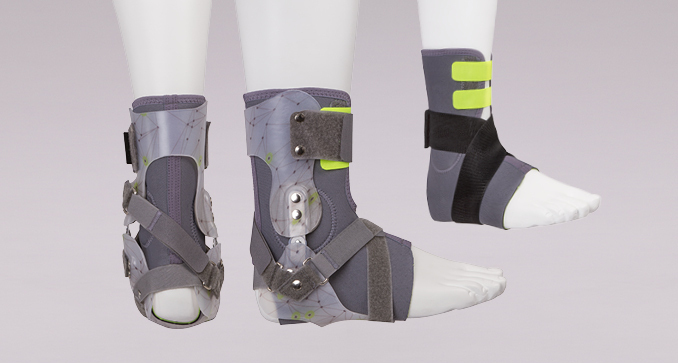 The elastic, thermoplastic foot part has a profiled longitudinal and latitudinal arch, it limits foot supination and pronation and it dynamically moves the foot back to the intermediate position during movement. 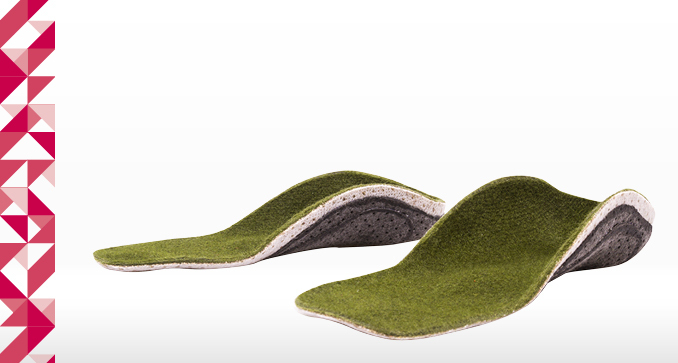 Designed for patients with impaired gait in diseases and dysfunction of the central or peripheral nervous system causing weakness of dorsiflexion, peroneal nerve palsy. Indispensable in healing and healing completion and perfect prevention of knee joint dysfunctions caused by traumatic degenerative and bacterial factors. Indispensable in the post-operational periods after arthroscopy, alloplastics, reconstruction, and surgical interventions to the joint. 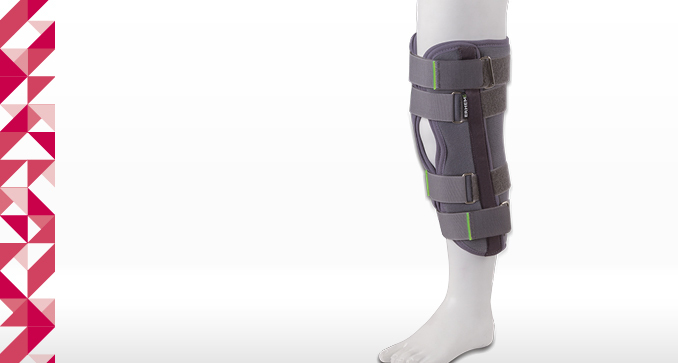 The apparatus is equipped with a polycentric biaxial splint with flexion/extension adjustment and a knee joint canopy, which facilitates the postural erection and movement of patients suffering from various muscular pareses. 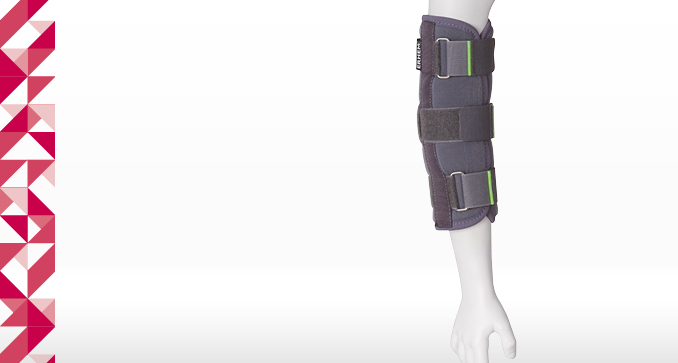 Indispensable in post-operative convalescence following arthroscopic procedures, knee joint alloplasty, reconstruction or surgical intervention around the joint. Device with two side bars. 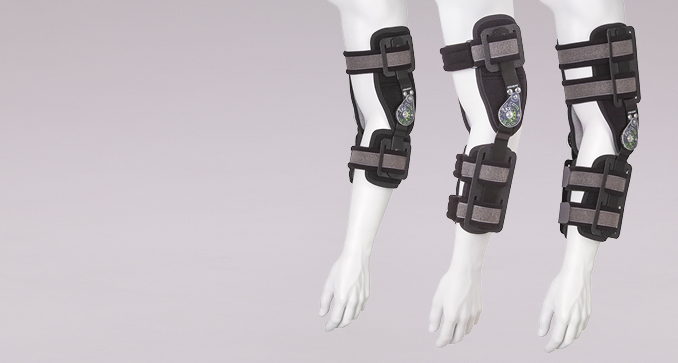 Provided with pneumatic knee extensor mechanism causing continuous, steady extension of the spastic limb joint within the range from 105 degrees to full extension. 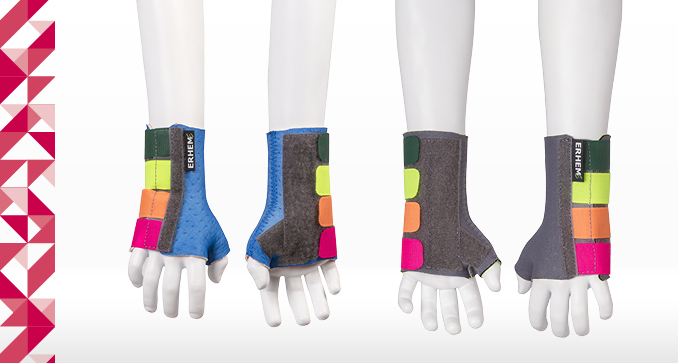 A perfect alternative to plaster braces. 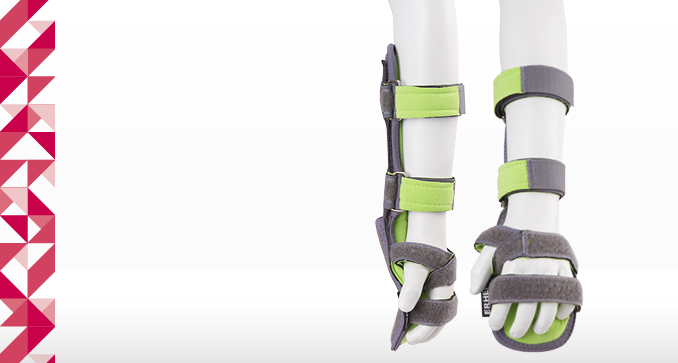 Stabilizes the lower limb in extended position or in a 20-degree bend. Indispensable in the post-operational periods after arthroscopy, alloplastics, reconstruction, and surgical interventions to the joint. Used in healing and healing completion of traumas and dysfunctions of the joint. 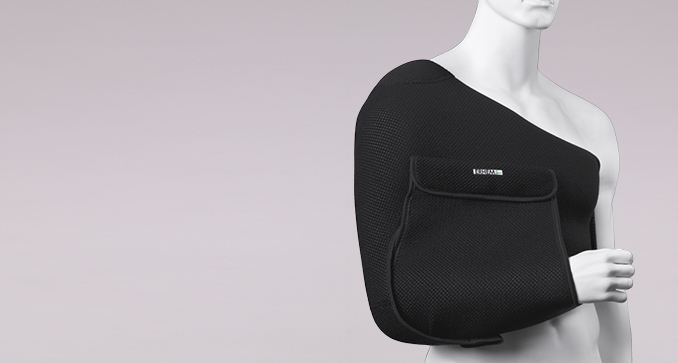 Ensures nursing and protection of the joint. Optimal design and protection system. Used in healing and healing completion of the traumas of the ligamentous apparatus. The product is used in healing and healing completion of traumas to the ligamentous apparatus, as well as for nursing and protection of the joint during the convalescence period. Optimal design and protection system. 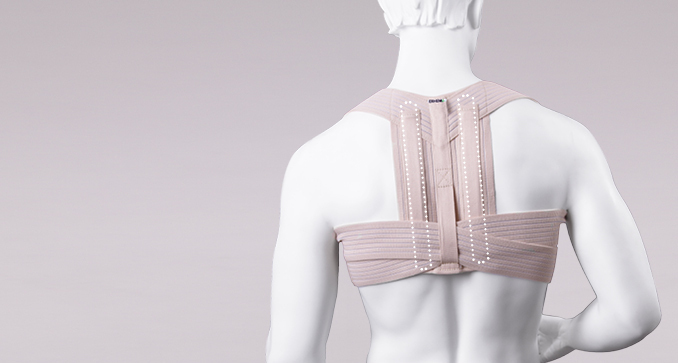 The light structure of the brace stabilizes the cervical section of the spine and segments from C2 to Th2. 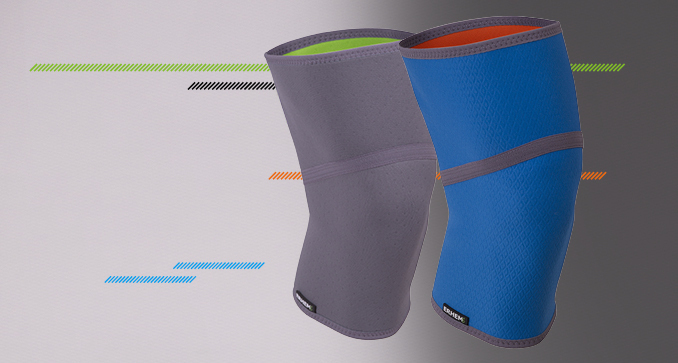 The open design of the collar facilitates its adjustment and provides easy access to the body. An alternative to the Jewett jacket. Enhances healing and healing completion after spine surgery, traumatic and osteoporotic vertebral fractures, as well as articular section dysfunctions. 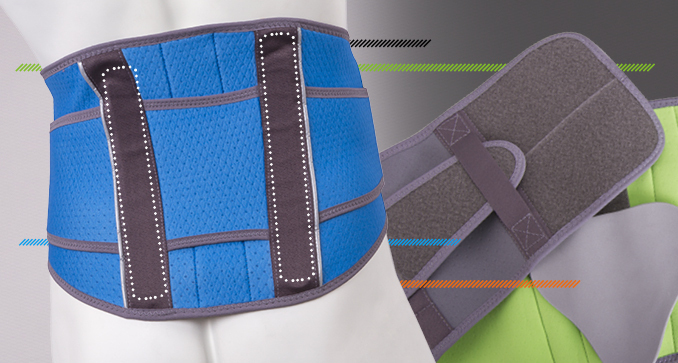 Provides stable immobilization on all planes to limit flexion, extension, side bends and spine rotation. 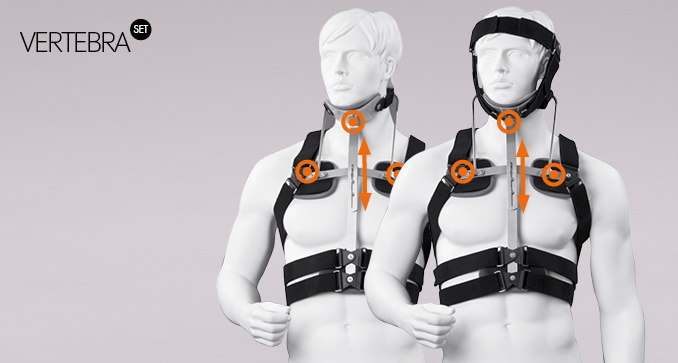 The device enhances treatment and its completion following surgical procedures of the spine, traumatic fractures and osteoporotic vertebrae. 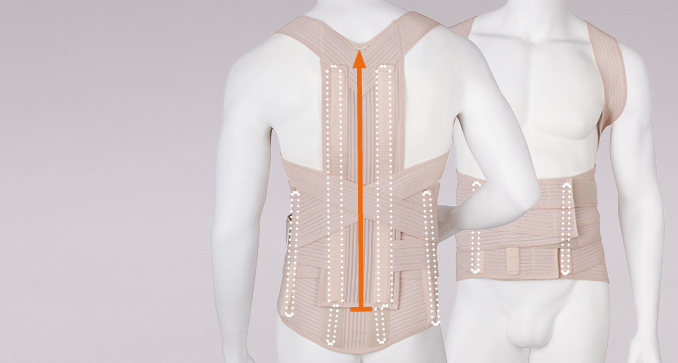 The light structure of the corset provides tri-planar stabilization of the entire spine. 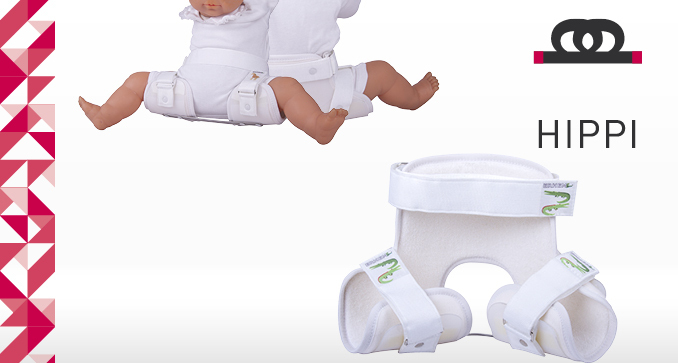 Its open design allows easy access to the patient’s body, as well as the adjustment of thoracic and head support pads to individual needs. The upright keeper is made of elastic, openwork fabric ensuring good compression, strengthened with two stainless steel reinforcements. 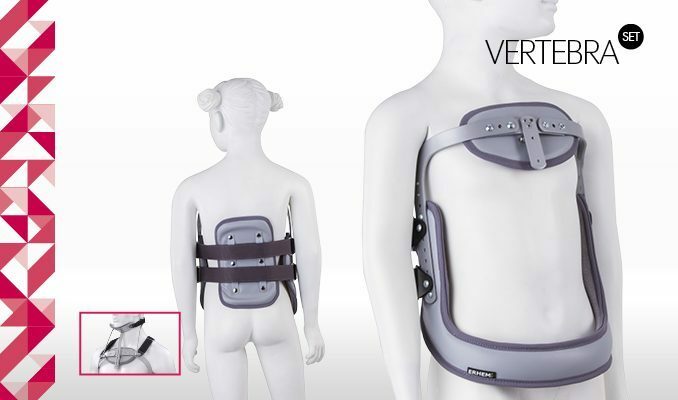 The dorsal part of the upright keeper and adjusting straps is fastened with a Velcro, which enables individual adjustment according to the patient’s needs and ability. 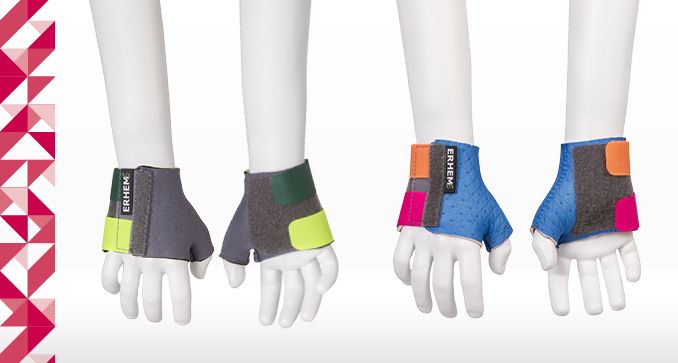 The materials used in production are skin friendly. 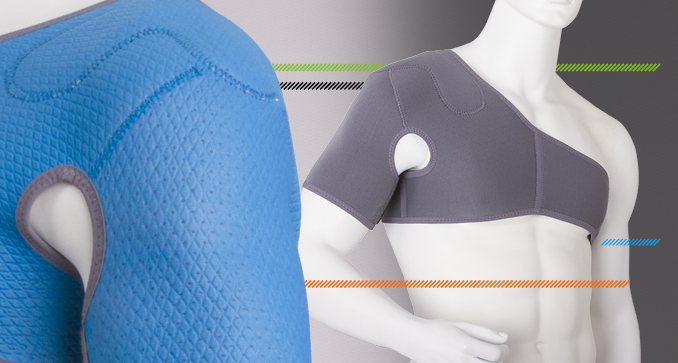 The two independent components (the high semi-rigid jacket and the dorsal section) allow adjusting the product perfectly to patient’s height and selective application during exacerbations and remissions of disorders. 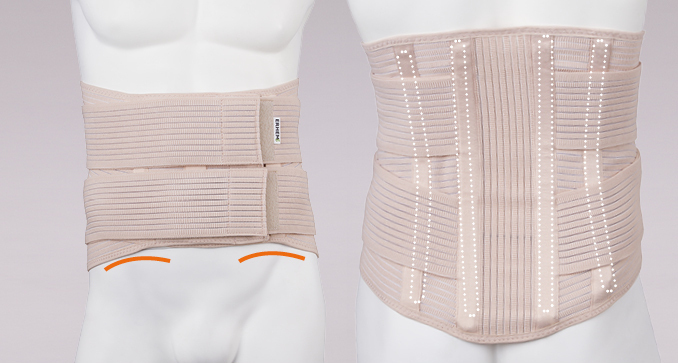 The product is reinforced with six flexible stainless steel fins shaped to reflect the lumbar lordosis. Enhances healing of acute and chronic lumbar-sacral disorders, caused by degenerative and productive disorders, as well as traumas, congenital and developmental factors. Designer for people carrying out hard physical work, as prevention of strains and supplement to the rehabilitation in ongoing disorders. The product is reinforced with four flexible stainless steel fins shaped, which reflect the spine curvature. 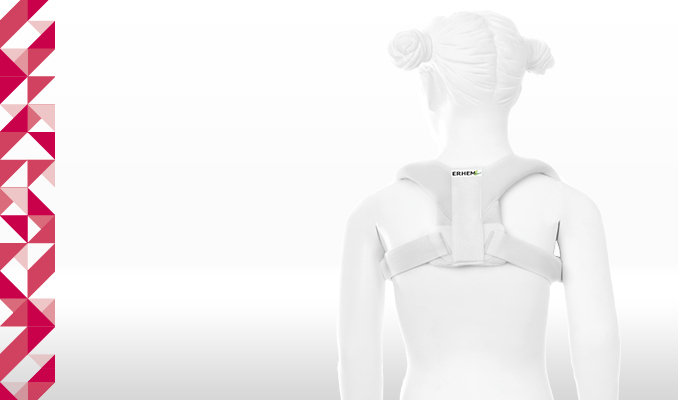 Designed for patients qualified for posture corrections as a supplement to corrective exercises in the process of augmenting proper upright posture. 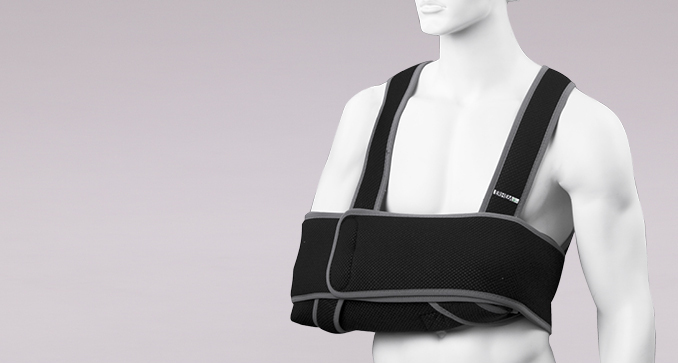 The extensive action of the shoulder brace relieves the vertebrae of the pectoral spine. 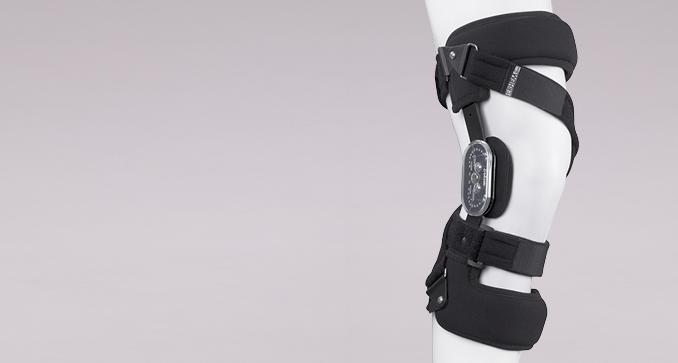 A wide range of application for patients qualified for posture correction makes the brace a complementary solution in corrective exercise regimes.